Drew Angerer/Getty ImagesFormer FBI Director James Comey. James Comey, the former director of the FBI, tweeted at President Donald Trump on Saturday and hinted at his upcoming book about their interactions. The tweet came after Trump slammed former FBI deputy director Andrew McCabe and accused Comey of being complicit in purported corruption and bias within the top ranks of the FBI and Department of Justice. Comey’s tweet also comes as he is expected to embark on a major book tour starting next month. 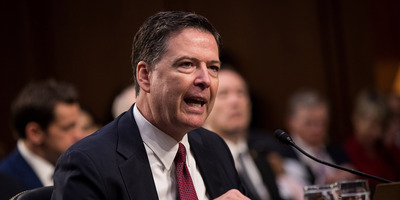 Former FBI Director James Comey took to Twitter to weigh in after President Donald Trump celebrated former FBI deputy director Andrew McCabe’s firing and accused him and Comey of being complicit in alleged corruption within the FBI. Comey’s tweet comes as he prepares to kick off a major PR campaign for an upcoming book about his time at the FBI and his interactions with Trump. He is expected to launch a book tour starting sometime next month. Attorney General Jeff Sessions ordered McCabe’s firing on Friday based on an investigation by the Office of Inspector General (OIG) into potential wrongdoing by McCabe. Sessions said the OIG report concluded that McCabe “lacked candor” and approved unauthorised disclosures to the news media that related to the FBI’s investigation into Hillary Clinton’s email use as secretary of state. The report has not yet been released to the public. Several current and former US intelligence officials criticised the move to fire McCabe just one day before he was set to formally retire from his post. Former intelligence chiefs John Brennan and Gen. Michael Hayden – both of whom are frequent Trump critics – also weighed in.